One year after fighting erupted across South Sudan´s Upper Nile region, many of those who fled the violence remain around the village of Aburoc. But soon this community will face a difficult choice: stay in the area, where living conditions are harsh and getting worse or return home to their old villages where tensions persist. In May, there were more than 38,000 people fleeing the violence for Aburoc. But when they arrived there was no shelter, water or food. Clashes between the government and opposition forces were getting closer and the community was contemplating another move. In the following months many left for the North. What remains is a market, a few tea shops, churches and even a bicycle repair shop. Heavily laden tractors from Sudan supply the stalls, but money to buy goods is in short supply. Most live in tightly clustered wicker shelters with badly ageing plastic sheeting as roofs. Things are only marginally better than when they were living in the open. In the past, the swamp was used as a water source but now it has dried up. During the wet season from May to November, the whole camp is seriously flooded, but during the dry months there is little or no surface water and it either has to be trucked in or sourced from deep in the ground. The community of 8,500 people will have to make a grave decision over the coming months. Between February and May, water will become scarce. The expensive option of water trucking from the distant Nile is still under discussion between the humanitarian community and the authorities. “Even though some of the international NGOs based in Aburoc are racing to provide water, it is important to remember that eight months ago there was a cholera crisis in the camp. 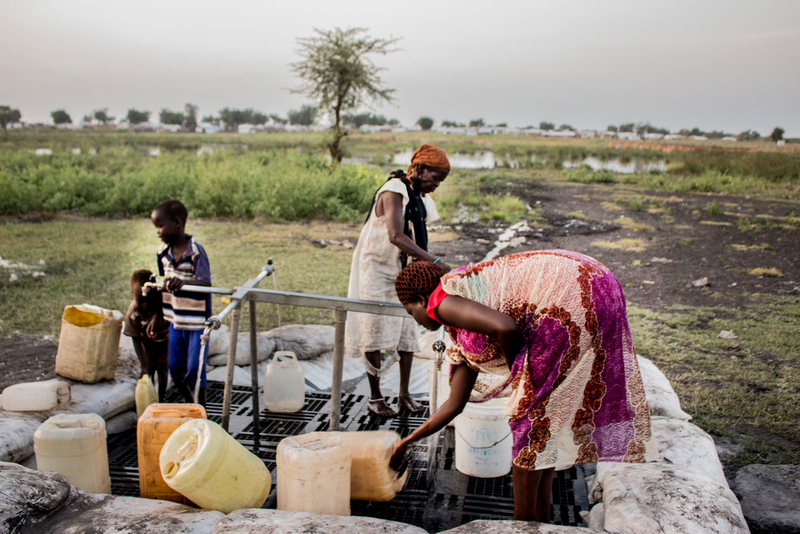 If we are to avoid such outbreaks again the quantity and quality standards of the water must be maintained”, says Jaume Rado, MSF´s Head of Mission in South Sudan. Today three options exist for the displaced community currently in Aburoc. They can stay put, perhaps for another year, and potentially see the conditions degenerate further, with diminishing access to clean water. They can return home to their villages and perhaps face the same violence they had fled from. Or, they can go north to Sudan, far from friends and family, where living conditions in the refugee camps are rough. But elsewhere another woman had made a different decision. “I will return home to my village in the coming weeks regardless of what happens. It was a good place and my family would be better there.” Her friends nod in agreement. Some humanitarian organisations in the area are starting to leave as they move to other emergencies. But the community still needs their support, as life in Aburoc is unsustainable without the provision of food, water, shelter and medical care. Even now food rations are so low, many IDPs have to find alternative ways to eke out an income to buy the essentials. Some as daily labourers for NGOs, others make and sell charcoal. It is not uncommon to hear of widowed women distilling and selling the local moonshine, called Marrisa, for a few South Sudanese pounds. MSF teams have have been with many of these people throughout their traumatic journey. 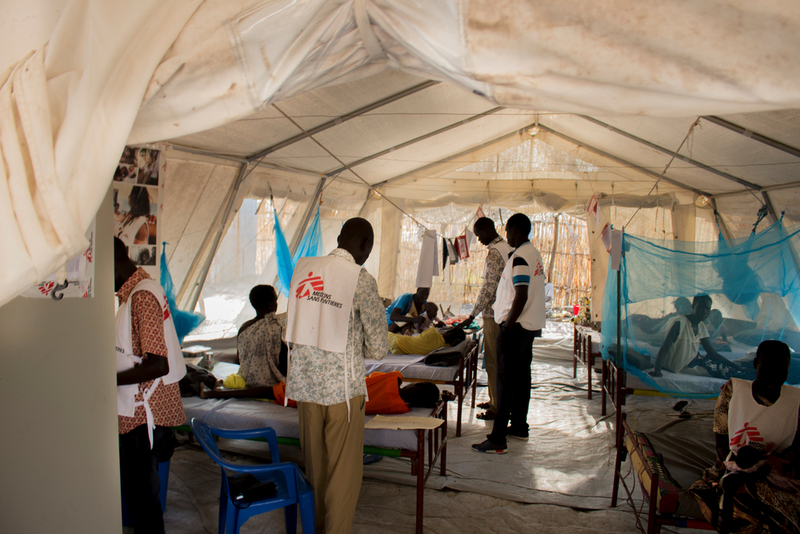 Two of its projects, in Wau Shilluk and Kodok, were destroyed by fighting and, as the population ran, MSF followed. In early February 2017, a small field hospital was opened in Aburoc to cater for the swelling numbers. MSF has operated a field hospital in Aburoc since May 2017. It provides not only services to the IDP population that amassed here during the crisis, but also to the local population. “In the early days we mainly saw patients with respiratory diseases, diarrhoea, all conditions linked with exposure to the elements. We were very concerned for patients who needed medication, such as those living with HIV,” explained Irenge Lukeba Landry, MSF medical activity manager at the time.